BLU is the pseudonym of an Italian artist who paints wonderful wall murals across Europe and in the Americas. 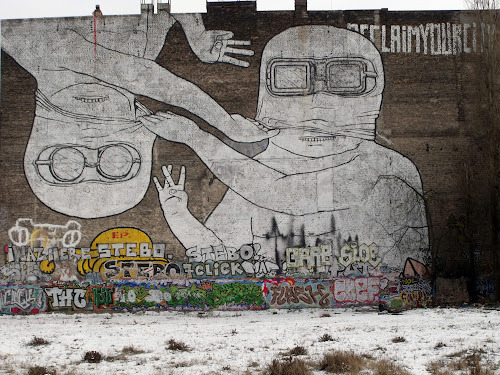 He painted a couple in Berlin on the sides of abandoned buildings across the wasteland of the corner of Schlesische Straße and Cuvrystraße back in 2007/08. Sadly they are no more; they have now been painted over in black. Unlike the Banksy murals that keep getting painted over by over-enthusiastic local UK Councils, these murals were erased mid-December 2014 at the instigation of the artist BLU himself. In a good example of someone throwing their toys out of the pram, he ordered his team to erase them. His reason seems to be because the area around here on the banks of the Spree is being bought up by property developers who are gradually erecting expensive, prestige apartment blocks. 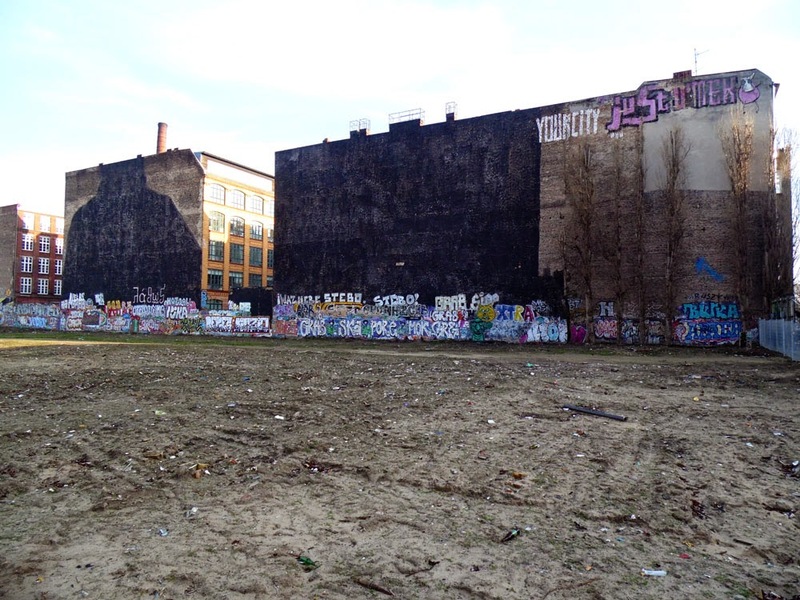 BLU did not want his murals to be used as a selling point for the window-view of apartments for yuppies and Russian capitalist émigrés. No way! Well, that is a great shame. I used to look forward to watching out for these murals on the S-Bahn from the airport, and they always made me feel excited that I was almost back in Berlin. Perhaps it is not the same Berlin any more. 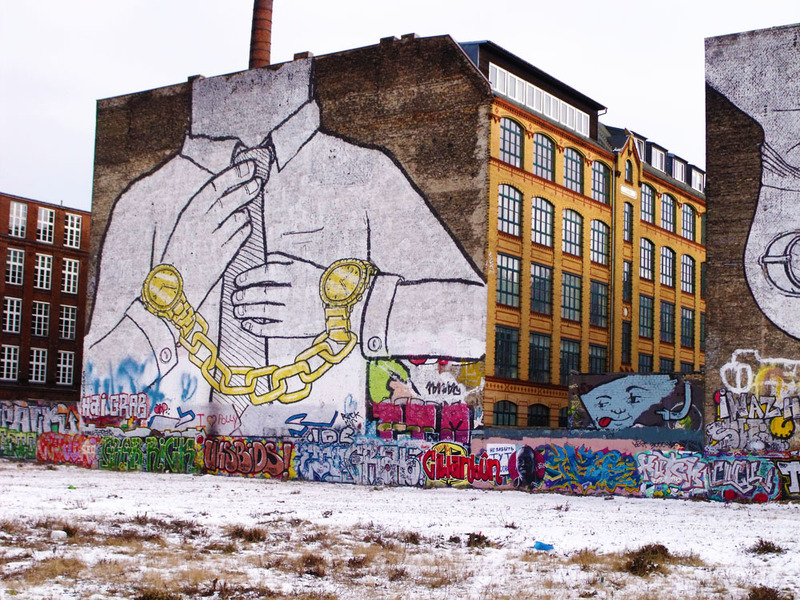 BLU as the artist has every right to destroy his own creations, and I do admire his sentiment for wanting to retain a bit of the 'arm, aber geil' bohemianism of Berlin after the downfall of The Wall, if not his hissy-fit way of doing it. And after all, graffiti art is by its nature supposed to be ephemeral, not something that is hung on the walls of art galleries for centuries. Anyway, the act is done now and there is no turning back the clock, even if Berlin City Council thought they could do that by spending millions getting the East-Side Gallery repainted. I like how BLU's team has carefully painted around the tags of the other graffiti artists! Respect in that at least! it really makes the other graffiti stand out even more - on the stark black background. I too will miss them. I had a hit and miss love affair with those as well.